Have you ever felt as if there isn’t enough time in the day to finish everything you have to do? Have you ever spread yourself too thin and now you’re stressed out between work, family, and personal obligations? You’re not alone. Over half of working adults and nearly half of all Americans are concerned with their current stress levels. As stress slowly but surely takes its toll on you, it’s very easy to develop unhealthy habits likes being inactive, emotional eating, eating unhealthy and non-nutritious foods, smoking, negative thinking, and depriving yourself of proper rest. These bad habits are the culprit behind many of the common health disorders people develop from stress, including hypertension (high blood pressure), anxiety, depression, and obesity. Many of us would like to think we have super-human capabilities making us immune to the health problems that stress can cause. Unfortunately, that’s not the case. Many of us are guilty of neglecting our health until something goes wrong, such as a rise in our blood pressure. Blood pressure is a crucial indicator of your health because it measures how hard your heart needs to work to pump blood throughout your body. A normal blood pressure reading is 120/80 mmHg or lower. Prehypertension is the prelude to high blood pressure, which falls in the range of 120-139/80-89 mmHg. Hypertension, or high blood pressure, is defined as a reading of 140/90 mmHg or anything higher. Over 75 million Americans have high blood pressure. Prehypertension and especially hypertension are very dangerous to your health because they signify that your heart has to work in overdrive in order to pump blood through your body. This extra pumping effort forces your blood to pound against the walls of your arteries, which easily leads to organ damage, weakened heart muscle, and hardened and narrowed arteries leading to stroke, heart attacks, kidney failure, and cardiovascular disease. The good news is that you can lower your blood pressure and regain your health by making certain lifestyle changes. You can control your blood pressure and decrease your chance of a heart attack or stroke. Your heart is a muscle, so if you strengthen it, it can pump more blood per beat so your heart rate and blood pressure will decrease. The best way to strengthen your heart muscle is by consistently doing aerobic exercise to build up your cardiovascular endurance. 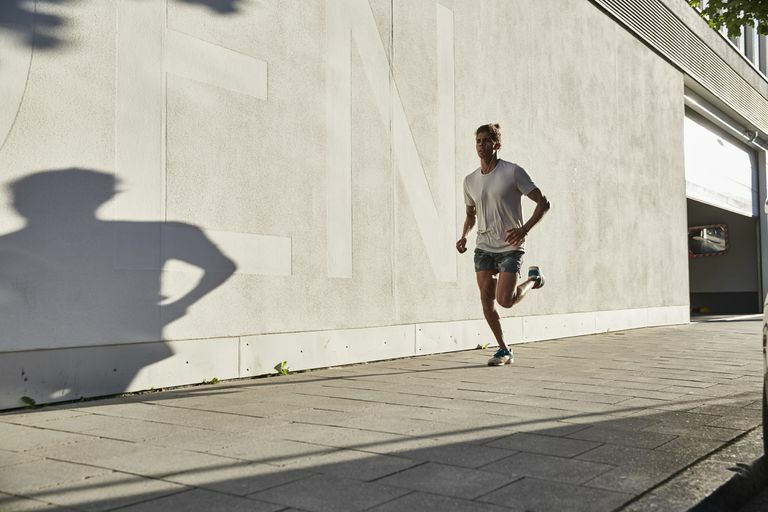 When you perform cardiovascular exercise, your body has to deliver large amounts of oxygen to your working muscles, such as your legs if you’re jogging. With regular cardio, your heart eventually gets better at pumping larger amounts of blood through your body with every beat so more oxygen gets delivered to your muscles. Your heart rate and blood pressure will decrease and you won’t get tired from simple activities as quickly as you used to. The American Heart Association advises that if you need to lower your blood pressure, aim for 40 minutes of moderate to the vigorous intensity of physical activity 3 to 4 times per week. You can always increase the amount and frequency of exercise as your endurance level increases. Make sure to do at least 150 minutes of physical activity each week performed at least at a moderate intensity level. A great example is brisk walking. Spread physical activity throughout your week as much as possible so it becomes a habit and part of your daily routine. Do flexibility and stretching exercises throughout the week and perform muscle-strengthening activity at least 2 days per week. Make sure to keep breathing throughout your exercise sessions as you’d be surprised with how many people tend to hold their breath. Make sure you pace yourself when you start your exercise program. Aim to work at a moderate to vigorous intensity to lower your blood pressure. To give you an idea of what a moderate level of intensity feels like, you should only be able to exchange short sentences of a few words while you’re doing your activity at a moderate intensity. If you can carry on a full conversation while you’re performing the activity, you’re working at a low intensity. If you find yourself getting out of breath quickly or straining to speak a just a few words, you’re working at a high intensity. Most people don’t need to check with their doctor before exercising at a moderate level, but it’s a good idea to talk to your doctor if you’re over 50 and you aren’t used to moderate intensity physical activity or if you’ve had heart trouble, heart attack, serious health problems, or a family history of heart disease at an early age. Your goal is to engage in a moderate-intensity level activity for a longer period of time each day or to engage in a more vigorous activity each day. Challenge yourself a little bit more every day to keep increasing your cardiovascular endurance, whether it be an extra minute on the treadmill or another lap in the pool. Regular exercise will make you feel better both physically and emotionally, which in turn motivates you to keep going. Everyone should incorporate cardiovascular exercise into their daily routines to maintain a healthy heart. If you have prehypertension, it’s crucial that you start an exercise routine to lower your blood pressure so it doesn’t keep rising to higher levels of hypertension. If you have hypertension, make sure you stick to a daily exercise routine and at the very least, do 40 minutes of moderate to vigorous physical activity 3 to 4 times a week. As your body conditioning increases, you can increase the frequency, duration or intensity of your exercise sessions throughout the week. Your blood pressure will slowly decrease if you stay consistent with your exercise routine. If you steadily build on your progress each and every day, you’ll be amazed at how easy improving your endurance and heart health can be. Consistent progress ensures success. Treat life as if it’s a marathon, not a sprint. Exercising Your Way to Lower Blood Pressure. American College of Sports Medicine. Web. Lower Stress, Lower Your Blood Pressure. Harvard Health Publications, 21 Mar 2015. Web. Physical Activity and Blood Pressure. American Heart Association, 17 Aug 2015. Web. Stressed Out Nation. Stambor Z. American Psychological Association, Apr 2006. Web. www.apa.org/monitor/apr06/nation.aspx. Strengthen Your heart With Regular Cardio Exercise. Yoon S. University of Maryland Baltimore Washington Medical Center. Web. The 8 Most Effective Exercises for Full Body Weight Loss. Skinny With Fiber, 11 Jul 2013. Web. Your Guide to Lowering Blood Pressure. National Heart, Lung, and Blood Institute: U.S. Department of Health and Human Services, May 2003. Web.